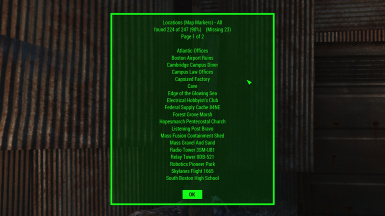 Automatically track missing quests, undiscovered locations, and locations you've never cleared, as well as missing magazines, bobbleheads, and audio holotapes! 05/22/16 - FallComplete 1.3 has been released! 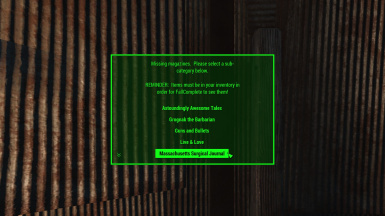 You can now mark missing magazines on your map, just like you already can with bobbleheads. 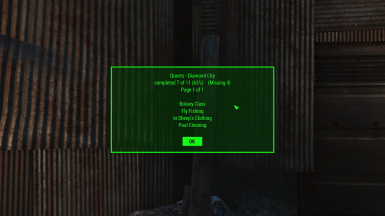 You can choose to either start a quest for each magazine individually (by selecting that particular magazine in the menu), or you can launch all of the quests at the same time. The FallComplete quests should also mark themselves complete correctly now. 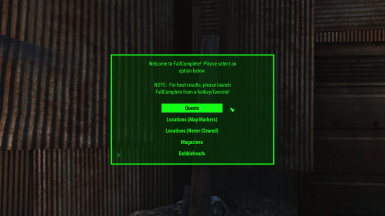 If you have a bobblehead quest that's currently "stuck", try restarting the quest from the FallComplete menu, and that should get it to mark itself complete (please let me know if this is not the case). FallComplete is the follow-up to the popular Skyrim mod SkyComplete (Nexus mod of the month December 2014!). 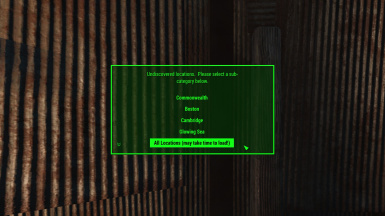 If you're looking to squeeze every last drop out of your Fallout 4 experience - complete every quest, find every location, buff every stat - then FallComplete is the mod for you! FallComplete will work with your existing saves, and does not require any external dependencies. It's also designed to be as unobtrusive as possible - FallComplete scripts only run when FallComplete is actually open, so it shouldn't interfere with the rest of your game! When you first start the mod, an item will automatically be added to your inventory called "FallComplete Launcher (under the AID section of your inventory). Simply use this item to launch the FallComplete menu! It is strongly recommended that you store this item as a hotkey/favorite, as the Pip-Boy can sometimes get in the way of the FallComplete menus. Any map marker that you have not yet discovered. Any location that you have not cleared at least once. 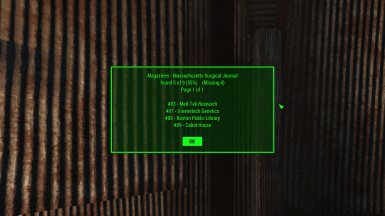 Any magazine that you have not found (magazines must be in your inventory for FallComplete to see them!). Any bobblehead that you have not found (bobbleheads must be in your inventory for FallComplete to see them!). 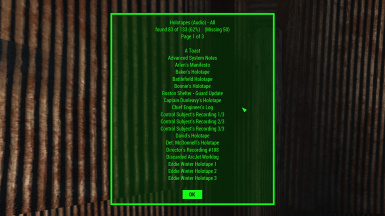 Any holotape with a audio recording that you have not found (holotapes must be in your inventory for FallComplete to see them!). Standard mod installation. Extract the files to your Data directory, then activate the mod through the official in-game menu (or whatever method you normally use). Once you're in the game, an item will automatically be added to your inventory called "FallComplete Launcher (under the AID section of your inventory). Simply use this item to launch the FallComplete menu! 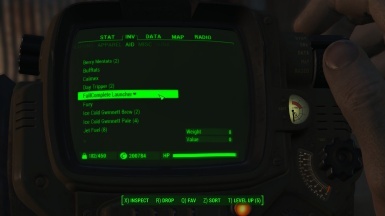 It is strongly recommended that you store this item as a hotkey/favorite, as the Pip-Boy can sometimes get in the way of the FallComplete menus. Both sites were used to gather some of the information used in FallComplete!